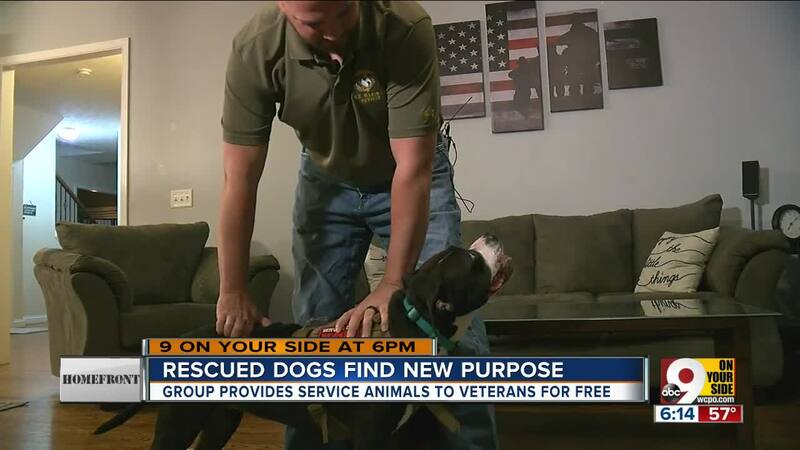 A group provides service animals to veterans for free. CINCINNATI — Echo, a dapper black-and-white rescue dog, knows more tricks than most. Walking With Warriors, a program launched by animal shelter Rescued and Ready, has trained her to become the perfect companion for a wounded veteran in need of love, comfort and psychological support. "She's been trained to sense anxiety and panic attacks, and her job is to break you away from that: Lick your face a little bit, crawl into your lap and get your attention," Walking With Warriors program manager Corinne Hurst said. Matching rescues like Echo with wounded veterans was a natural fit, according to Rescued and Ready founder Mandy Franeschina. "There are 3.8 million veterans who have a combat related disability right now in the U.S., and at the same time we're euthanizing healthy adoptable dogs by over three million a year," she said. "Well, it just seemed to make sense these two populations could be helping each other." It takes up to two years of extensive training for each dog in the program to be ready to be a service animal. Rescued and Ready sought out corporate sponsorship to pay for the cost; Cincinnati-based HVAC company Apollo Home picked up the tab for Echo's education. Marine Corps veteran Samuel Deeds, who survived a blast from an improvised explosive device while serving in Iraq, will benefit from the results. Echo's training enables her to be a physical and mental helper for him on a day-to-day basis. "When I am having issues with my back leg to get up, she'll stand in front of me, and the command is, 'Brace,'" he said. "She just gets there and gets wide, and I put my hands on her hips and shoulders and push up." Deeds can list off-hand the injuries he sustained from the IED: "A one-third open tibia fracture, multiple shrapnel wounds to my upper and lower right thigh, shrapnel wound to my right groin, two broken metacarpals on my right hand, shrapnel to my forearm on my left side, shrapnel to my right hand and shrapnel to my forehead." The less visible effects included traumatic brain injury, post traumatic stress and a concussion. He now deals with anxiety and panic attacks brought on by a wide range of triggers. "Sometimes it's a smell, sometimes it's a taste, sometimes it's something I see on the road...a cardboard box or a deer carcass or going underneath and overpass...because when I was in Iraq they were standing on the overpasses dropping grenades or hiding IED's in the overpass," Deeds said. Echo and Sam will become a forever pair Sunday, and she will provide support and assistance when he's in public. "She has the guard that's for, like, at the supermarket just to give me some space," Deeds said. Each service dog trained through the Walking With Warriors program is provided at no cost to the veteran. The company is currently training three more dogs to eventually be paired up with wounded vets.